Depending on your perspective, this post will either be a helpful public service message, or an indulgence in nonsense. Kind of like seatbelt advisements. If you are fascinated by history, have gorged yourself in your youth on medieval-themed movies, or find yourself in the exciting yet precarious position of moving to Germany, then please read on. If none of these sound like you, then please kindly go back to whatever it was you were doing before you stumbled across this post. In return, I will remove the only keywords that could have brought you here by mistake: “model” and “fashion”. Okay, and maybe “couture”, but I’m keeping it cause it sounds fancy. Many people moving to Europe will find themselves adopting different aspects of their new country’s culture: If you are now living in France, perhaps you have acquired a penchant for their delicious desserts and a disdain for boorish Americans. If you find yourself in Italy, you may have become something of a wine connoisseur and now race tipsily down Roman allies on your scooter at mach 3 while screaming “I love Italy”! If this seems oddly specific, I may have spent some time in Italy. So trusting, those Italians; They really should lock their scooters. If you are now living in Germany, however, you can’t help but notice the abundance of castles. Big, beautiful, “once-occupied-by-knights-with-swords” castles. Every town and city has at least one, and most have a couple of others dotting the surrounding hillsides. Our town is no exception. The town in which my family and I live, Bad Mergentheim, is the former headquarters of the Teutonic Order (Deutschorden) and was also a base for the Hospitallers (Johanniter). Heck, even the Templars had a presence here as I found by going through online historical documents, though all I could find conclusively was that they owned land here, and had a vineyard. Oh, those Templars. Always up for a party. We call our house our castle, of course. Everyone does as “every man’s home is his castle”. But when one lives in a land where real castles abound, one can become easily confused, especially when one’s home sits on a hill over-looking the town as ours does. Perhaps this is what happened to me. Perhaps it was the way I would stand on our balcony and loudly address our neighbors and passersby as “my loyal subjects”. It’s a mystery, really. Regardless of how it happened, I have added screen-shots of Facebook posts to help illustrate my descent into my particular form of culturally-induced insanity; Medieval Madness. The first step toward my affliction started innocently enough; I wanted to hang a shield with two crossed swords in our foyer. “Pretty standard, really”, I thought, but this was my first mistake. It seems that having medieval weapons in one’s entryway is actually not all that normal. Anyway, since I was brought up to believe that “anything worth doing is worth doing right”, I wasn’t content to simply purchase a pre-made shield with attached swords. Most of them look cheap, and I wanted something special. I redesigned my family crest and made a shield with a custom hanger for two swords that I had purchased for this purpose – though these swords turned out to be less authentic than I had hoped. They are high carbon steel (good), but they have not been tempered (bad). Oh, young Jim; you still had so much to learn. Clearly, the wall that it hung upon would also need a medieval-ish looking baroque wallpaper. Satisfied, but not entirely happy, the space needed a bit more. A cowhide rug, and a sheepskin laid over a rustic leather bench, did just the trick. As luck would have it, Eve and I had also just started watching Game Of Thrones. Like warm water under a tropical depression, this show added the fateful ingredient to what would end up creating the perfect storm. What started out as merely a modest slice of interior decorating spiralled quickly into a time-consuming hobby. The next month was Christmas. Every year, I design holiday cards by relabelling food products. That year, I decided to give beer bottles by designing labels for our own castle-themed brewery; Burg Bier (Castle Beer). Anything worth doing is worth doing right, right? Naturally, I bought Eve a medieval-style dress, a surcoat and chainmail coif for myself, and a lion mane for our dog, Buster. Busy with work, a small child, and home renovations, the next post took quite a bit of time. It was nine months later that I posted the following. You can see that our GOT watching had begun to take its toll. Energized by the shenanigans of John Snow and the refreshing cold of the approaching winter, it wasn’t long before I had my first medieval helmet; a birthday gift from my lovely wife. Needing a place to properly display my growing collection, I bought a bust to put the chainmail and new helmet on. I called him George. A few short months later, my hobby had rapidly slid into an obsession. I bought an authentic Hospitaller surcoat. I bought a gambeson. I bought a chainmail hauberk, an 11th century kite shield, and my first real sword: A 12th century Templar sword, with scabbard and sword-belt, from Darksword Armory (https://www.darksword-armory.com/medieval-weapon/medieval-swords/12th-century-templar-sword-1340/). This is a real thing of beauty, by the way. Hand-forged from the best steel, and with a hand-stitched leather-wrapped wood handle. After seeing and holding it, I knew that all other swords must be purchased from this company (foreshadowing). Needing a new way to display all of the new gear, and as evolution mandates through necessity-driven adaptation, George magically grew a full torso with arms. Darwin be praised! Poor from these purchases, I needed time to rebuild my coffers before I could add to my collection. The waiting was not easy, as any addict knows. There was sweating, cursing, and uncontrollable shaking…and that was only from Eve as she attempted to keep my spending at bay. As a compromise, we agreed, to satisfy both my growing addiction and to provide a source of entertainment for my budding squire, that I would design and begin construction on a play castle for Sam. Though the outlet proved helpful, it was still too cold to make much progress, and so I broke down the very next month and bought George an authentic late 13th century Great Helmet. Like an accessory for a medieval runway model, it gave George just the right touch of both style and menace. Had it been a competition, George surely would have won. I was like a much less attractive Heidi Klum, and George was my star. A short while later, it had warmed up enough to make some real progress on Sam’s castle. Two months and several hundred hammered thumbs later, the project was finally finished. Sam was overjoyed, as were Eve and I. The unveiling even gave me a reason to wear George’s helmet. By the way, wearing a knight’s helmet while standing atop a castle that you constructed in your own backyard does little to assure your neighbors that you are not crazy. Plus side: Far fewer people ring our doorbell. 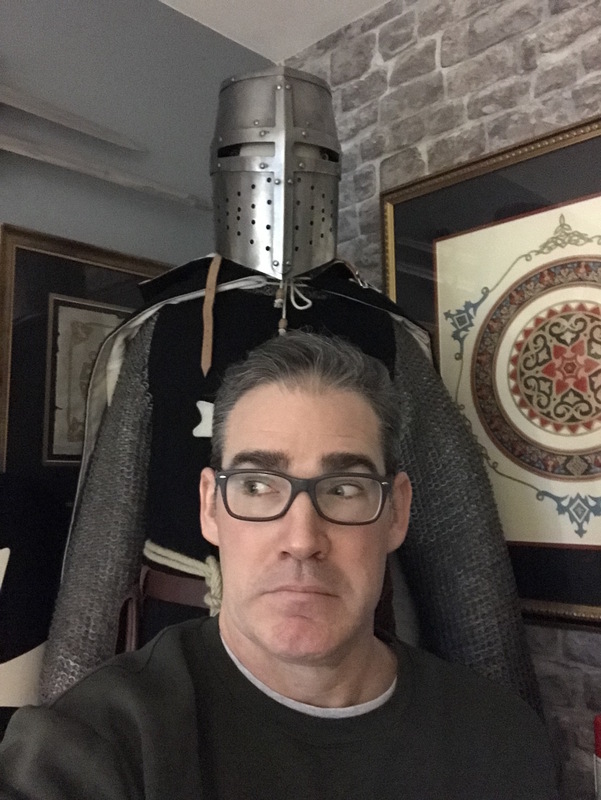 Though George was unhappy that I had borrowed his prized hat for the play castle photo shoot, I was able to make it up to him in September when he received yet another new helmet, this time a 12th century Enclosed Helmet. I didn’t have the heart to tell George, but it looked way better on Sam. That same month, I began to realize that George…had changed. Cobbled together from bits and pieces that I had pillaged from various sources, he had begun to take on a life of his own. Tired of serving my needs, he began to exert his own will. Under the guise of a birthday present for me, he demanded yet another new helmet, this time a shiny mid-13th century Great Helmet. He had become my own medieval version of Frankenstein’s monster, and that monster was such a fashionista. In addition, George must have begun throwing telepathic wish-spears at my head, which is presumably why I was forced to buy him yet another sword. I like this explanation as it not only frees me from responsibility, it makes me the victim (see Eve? It was George’s fault!). The sword in Question? Darksword’s Crusader Sword (https://www.darksword-armory.com/medieval-weapon/medieval-swords/the-crusader-sword-1303/). Great. Now George not only has free will, he has two swords. As my collection had grown, I decided to add some museum-style labels in November. This was partly to help others identify the type and origin of each piece, but it was mostly to add some much needed credibility. Museums garner respect. Some guy haphazardly stocking his home with medieval weapons and armor… Not so much. The new year saw the addition of some much needed items. The cold weather necessitated George receiving a new cloak, as well as a stonewall backdrop so that he would have a more natural-looking and comfortable habitat. More wish-spears had clearly found their mark. The latest, but certainly not the last, addition was actually a gift from my thoughtful, if not bemused, sister-in-law. She gave me a changeable message sign, and suggested I use it to advertise my museum’s hours of operation. Done. But I also added a disclaimer to not feed George as he had became a tad too thick in the middle from his holiday indulgences. From the photo below, I can only assume that these two had been sneaking him cookies and ale. It is unwise to keep food from anyone over six feet. Even more so if that someone is a well-armed Frankenstein’s monster/knight that becomes hangry when his blood sugar drops. And so concludes this public service message post about adopting your new countries culture. Everything will most likely be fine, even if, like me, you go a bit too far in embracing that culture. Remember, we create the life we want. But also remember that sometimes, the life that we created wears chainmail and throws thought-guided wish-spears at your head. Wait. What are you all looking at? He’s standing right behind me, isn’t he? Jim, your humor is always as sharp as your swords’ edges! Enjoyed the entire commentary! Had seen your facebook posts, throughout the 2-year collection spree. (Wink) Got a kick out of seeing Shannon’s likes/name on so many posts!